1. Support microphone, guitar, electronic piano and other audio equipment input simultaneously. 2. Sensitive three segment equalizer, adjust the overall tone, high and low bass easy to adjust, look for your own voice. 3. Good compatibility and stability, directly connect the sound card to the computer, stable and reliable, compatible with multiple devices. 4. USB power supply design, please use the attached USB2.0 cable to connect the device with the computer, provide power and audio data transmission. 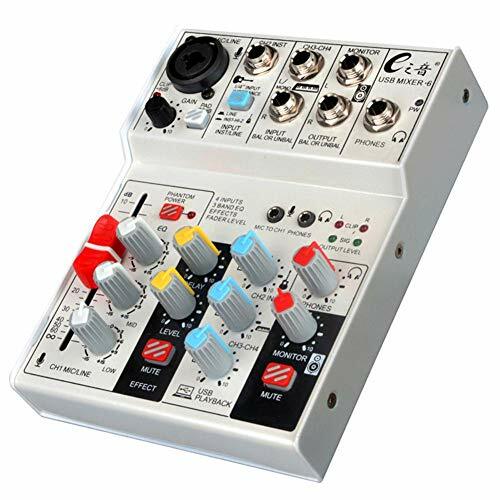 Support microphone, guitar, electronic piano and other audio equipment input simultaneously. Sensitive three segment equalizer, adjust the overall tone, high and low bass easy to adjust, look for your own voice. Good compatibility and stability, directly connect the sound card to the computer, stable and reliable, compatible with multiple devices. USB power supply design, please use the attached USB2.0 cable to connect the device with the computer, provide power and audio data transmission. If you have any questions about this product by Widewing, contact us by completing and submitting the form below. If you are looking for a specif part number, please include it with your message.